In the last few years, the cultural landscape of Bedford has flourished like never before. From world-class exhibitions at The Higgins, festivals like Bedfringe, the Bedford Film Festival and the Conscia Jazz Festival, to smaller, regular events like Roll Your Own Records, the many BedPop pop-ups and Drink & Draw’s with the Circus of Illustration. If you’re looking for art, music, theatre or film, there are people in Bedford making sure we see the best of what’s on offer. One of the events that really encapsulates the spirit of arts and culture in our town is BedPop Fun Palaces. 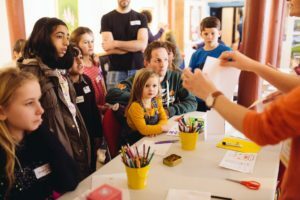 Returning to Bedford for its third year, Fun Palaces in an international celebration of arts, culture and science that will be popping up in over 250 towns and cities across the world on the 7th and 8th of October. Here in Bedford, BedPop have teamed up with a host of local artists, schools and organisations to deliver a diverse programme of workshops and events all of which are entirely free for the young people in our town! 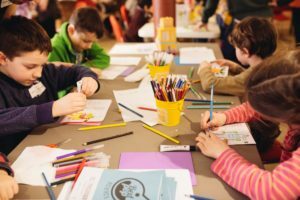 Be part of a living mural, make a leaf crown, fly a drone, meet the worlds largest millipede, take in some live theatre OR join the Circus of Illustration for one of three exciting workshops! Super-charge your drawings at the Circus of Illustration’s election drawing workshop. Using conducible drawing materials, we’ll learn all about circuitry while making your drawings light up, buzz and (nearly) come to life! Before Disney and Pixar were even a blip on the horizon, those clever Victorians invented a toy based on the same founding principle of animation, persistence of vision. Combine two drawings into one as we make our own optical illusions! 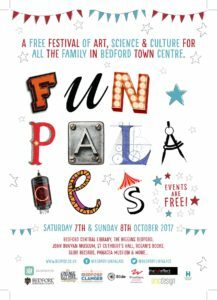 To book and to find out more about BedPop Fun Palaces click HERE, and we look forward to seeing you this weekend!